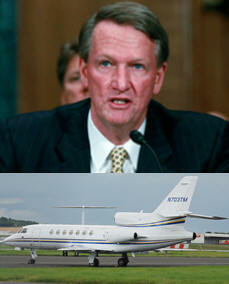 May 31, 2011 - Remember in 2008 when the CEOs of Ford, Chrysler and General Motors, flew on their corporate jets to Washington, D.C., to plead before congress for a taxpayer bailout? When it was learned that each roundtrip fight cost about $20,000 it resulted in bad publicity which prompted GM to try to prevent the public from tracking its planes in databases compiled by the Federal Aviation Administration. Well the public will soon have greater access to online information about the flight paths of general aviation aircraft, U.S. Transportation Secretary Ray LaHood announced on Friday. The change will be effective 60 days from publication in the Federal Register. Operators of general aviation aircraft no longer will be able to cite privacy as a reason to prevent the public from viewing their flight information on Internet sites that show the registration number, flight path, departure point and destination, and flight length for all aircraft operations over the United States. In the future, the Federal Aviation Administration (FAA) will block public viewing of this information only after the operators certify that they have a valid security concern. As before, neither the sites nor the aircraft owner or operator will disclose the identity of persons on the flight, the purpose of the flight or the reason for the security concern. ?This action is in keeping with the Obama administration?s commitment to transparency in government,? Secretary LaHood said. ?Both general aviation and commercial aircraft use the public airspace and air traffic control facilities, and the public has a right to information about their activities.? Since 1997, air carriers, corporations that own and operate aircraft, professional aviation organizations and government agencies have had access to the real-time flight information of both airlines and general aviation through the Aircraft Situational Display to Industry (ASDI) and National Airspace System Status Information (NASSI) websites. Other members of the public have been able to subscribe to this information with the data delayed five minutes for security reasons. While commercial air carriers? schedules are available to the public, the operations of general aviation aircraft cannot be tracked except through one of these electronic systems. In the future, the only way operators and owners of general aviation aircraft will be able to block displays of their flight information is by providing the FAA written certification that revealing this to the public would pose a valid security threat. Fridays amendment makes final a proposal issued on March 1. The National Business Aviation Association (NBAA) has strongly denounced this decision made by DOT. "We are outraged at the government's move," said NBAA President and CEO Ed Bolen. "As we've said repeatedly, there can be no legitimate reason for a government agency to facilitate the monitoring of wholly private activity by anyone with an Internet connection. This incomprehensible policy reversal gives anyone in the world ? terrorist, criminal, tabloid stalker, business competitor ? the equivalent of an Internet homing device to track the movements of citizens and companies in real time." Bolen went on to reject the claim made in a May 27 press release revealing the government's plans for dismantling the Block Aircraft Registration Request (BARR) program that publishing an airplane tail number doesn't reveal the identity of the travelers aboard. "That argument is pure sophistry," Bolen said. "With an aircraft tail number, anyone with a little initiative can quickly determine the travelers on an aircraft." To illustrate his point, Bolen cited a front-page article, published in The Wall Street Journal on May 21, that describes the flying patterns of numerous citizens and companies based on tail-number information alone. Bolen noted that Congress enabled the BARR program out of the recognition that getting on an airplane should not be tantamount to forfeiting security or privacy. "That's why the House of Representatives, thousands of individuals and companies and organizations including the U.S. Chamber of Commerce, the National Association of Manufacturers and the Business Roundtable have opposed the government's gratuitous invasion of privacy rights," he said.